Limited Edition -- ONLY 600 Lenses Worldwide! 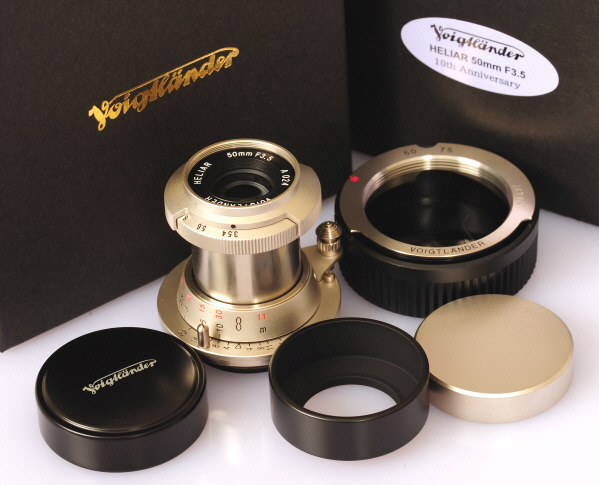 The 2009 Nickel Voigtlander 50/3.5 Heliar is a new version of the 2001 50/3.5 Voigtlander Heliar which tested out as the sharpest lens EVER tested by Popular Photography! Only 2000 were made for the 101st Anniversary sets, but only 600 in the 2nd edition. 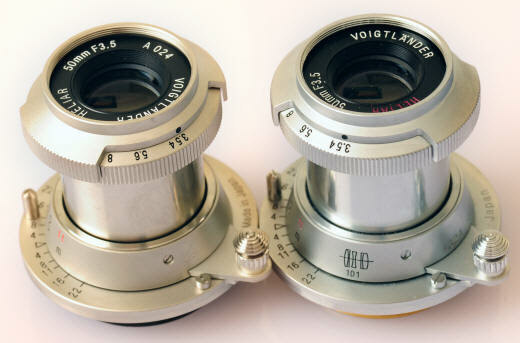 Special Serial Number: 600 each of the nickel Heliar 50/3.5 and 50/2 were produced. The serial numbers are divided up into 6 groups starting with H, E, L, I, A or R. Numbers ranges from 001 to 100. The lens above is A024. Included is your choice of a Type I or Type II Screw Mount to M Bayonet adapter! NEWBIES: Collapsible lenses are pulled outward from the camera body, then turned towards the viewefinder eyepiece to lock the lens into shooting position. Fail to do this and you will get very out of focus images. When not shooting, you can collapse the lens into the camera body to 1st unlocking it by turning it in the opposite direction, and then pushing the lens barrel into the camera body. RANGEFINDER NEWBIES: This is a Leica Screw Mount Lens. It will work perfectly and rangefinder couple to all classic Leica Screw Mount cameras, including all Leica Screw Mounts (II, III, IIIa, IIIb, IIIc, IIIf, IIIg), Voigtlander Bessa R, Canon Screw Mount rangefinders -- to name a few. IN ADDITION just add a 50mm screw mount to Leica M adapter, and the lens will mount and rangefinder focus on all Leica M mount cameras. 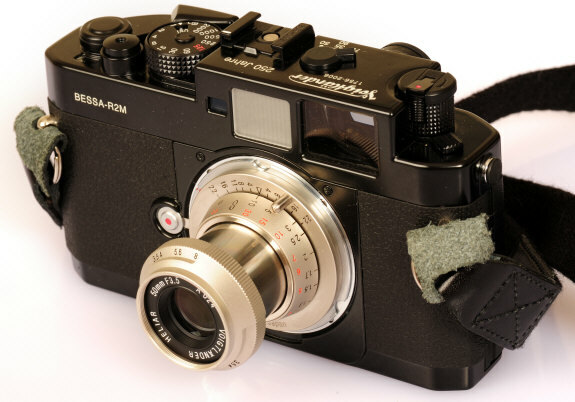 COLLAPSIBLE NOTE for Leica M8, M8.2, M9, M5, CL: On my sample cameras, the Voigtlander 50/3.5 Heliar Leica mount lens collapsed safely into the camera bodies of the Leica CL, M9, M8 and 8.2, but not the M5! Note that there are most likely unknown production variations in both the lenses and cameras. so proceed with caution before you inadvertently jam or damage your camera. In the March 2002 issue of the American Photography magazine Popular Photography, you will find a hands on report of the 101 Heliar set on page 48. Herbert Keppler, camera reviewer extraordinaire, reported "This wild but fascinating super classically styled camera comes in four delicious flavors and has what may be the best lens we have ever tested." "Exquisite lens mount." "We were very impressed with the immaculate finish of all parts of the Bessa-T Heliar 101 Years camera, lens, and trigger winder -- certainly a future collector's item." The 50/3.5 Heliar lens test on page 74 was extraordinary. "Superb, all-metal, high-precision collapsible-tube lens mount." "SQF results were excellent -- on a par with the best lenses we have ever tested." "A handy, high-precision, magnificent lens to treasure. It's doubtful that any other commercially made lens will produce superior results." Shown above is the 2009 10th Anniversary nickel Voigtlander 50/3.5 Heliar besides the chrome 2001 50/3.5 101st Anniversary Heliar. Do you see that funny looking knob on the right hand side of the lenses? Those are infinity locks. What's an infinity lock you ask? The first interchangeable 50/3.5 lenses introduced on the Leica II of 1932 (same year as the fabulous 1932 Los Angeles Olympic Games) had infinity locks. This was to conveniently keep the lens focused at infinity, since the experienced photographers of the time knew most of their shots would be of faraway objects. Push down on the knob (or inward towards the camera body) to unlock the infinity lock and focus at closer than infinity distances. Bring the lens back to infinity and the lock will automatically engage for your shooting convenience, just like Oskar Barnack (inventor of the Leica camera) and Ernst Leitz II (owner of the Leica factory) liked it. 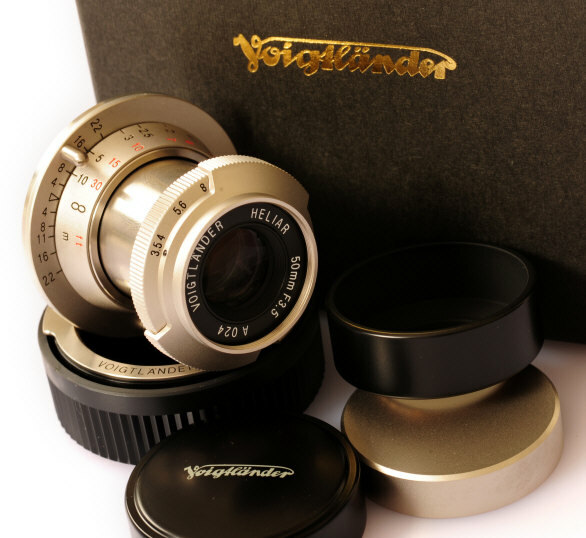 Cosina's CEO Mr. Kobayashi styled his modern Voigtlander 50/3.5 Heliars in homage to the history of 35mm Photography. 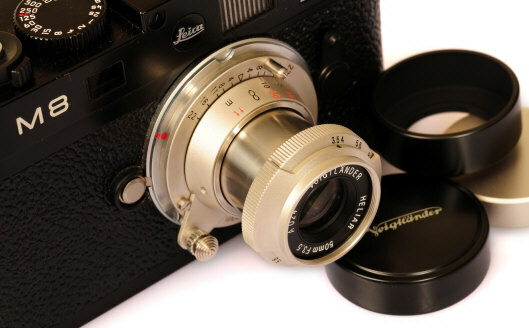 Coincidentally the original vintage 1932 50/3.5 lenses for the Leica II just happened to be nickel plated, not chrome. Revised: July 19, 2018 . Copyright © 2009 Stephen Gandy. All rights reserved. This means you may NOT copy and re-use the text or the pictures in ANY other internet or printed publication of ANY kind. Information in this document is subject to change without notice. Other products and companies referred to herein are trademarks or registered trademarks of their respective companies or mark holders.